These excerpts from New Musical Express, kindly selected for 'Beyond the Pale' by Yan Friis, show Procol Harum introducing Mick Grabham ('a charming person'), triumphing at the Rainbow, wowing Copenhagen, and touring Britain. Mick Grabham, former guitarist with Cochise, has joined Procol Harum as the replacement for Dave Ball who has left to go with the Long John Baldry Band. Grabham makes his début with Harum on September 22 in their concert at London Rainbow with the Royal Philharmonic Orchestra and the Pro-Arte Singers. It will be the first time the outfit has played with a full orchestra since they recorded with the Edmonton Symphony Orchestra late last year. The Harder They Come, Jimmy Cliff etc. Pictured left - the solemn face of Gary Brooker, vocalist, pianist and liturgical linkman of Procol Harum. Procol, plus the Royal Philharmonic orchestra, play London's Rainbow on Friday (see below), featuring - we are informed - music from their Edmonton album. London Rainbow: Procol Harum / Royal Philharmonic Orch. Would you believe it's been over five years now and most people still can't spell "Procol Harum" - or is it "Procal Harem" or ... Brooker, Reid and Co. are still getting their own particular kind of boogaloo on, and it should be a good evening for the more solemnly-inclined - or even the more somnambulistically inclined. See pic above. Procol Harum are also booked on Sunday at Liverpool Stadium and Monday at Newcastle City Hall, according to the NME. No Procol-related stuff at all in the September 30 issue. But I have to mention the 1972 NME Musicians Poll where the paper asked 100 famous singers to name their Top 3 vocalists. The winner was John Lennon, with Paul Rodgers (No. 2) and Bob Dylan (No. 3). More interesting is it that none of the participants mention Gary Brooker. And worse still, NME did not included Gary among the 100 singers they asked. And Matthew Fisher? Now, who on earth is Matthew Fisher? Keith Emerson won, by the way. NME's Musicians Poll, this time guitarplayers. Winner is Jimi Hendrix. Robin Trower is neither asked for his opinion, nor mentioned by anyone. If there's one band with the class and elegance to successfully combine on equal terms with the Royal Philharmonic Orchestra then it had to be Procol Harum. And as they proved so convincingly at the London Rainbow last Friday their dark, dramatic music has much to gain from such an ambitious enterprise. Before Procol themselves took the stage the Philharmonic had a short warm-up session of their own, running through a bit of Vaughan Williams and Liszt, all of which was dutifully applauded by the audience. After a short interval Procol appeared and, with Gary Brooker dressed in a dark blue navy jacket, launched into Shine on Brightly followed by Whaling Stories and a new one called Fires that Burn Brightly [sic]. Apart from just having to get used to the unusual sight of quite so many people on stage, at first it seemed the combination between band, orchestra and Pro Arte singers was a little shaky, partly due to an uneven balance. But by the time they all moved into the heavy chords of Simple Sister, Procol had firmly taken control, with the orchestra providing just the right amount of colouring. From then on things worked smoothly, especially on Conquistador, the magnificent Salty Dog, and a magnificent new piece called Grand Hotel, 'bringing back all the grandeur of former times,' according to Brooker yet with the slightly chaotic, wayward feel inherent in so many of their numbers. At times the whole concept threatened to become almost too grandiose, too melodramatic, but with new member Mick Grabham obviously quite at home and cutting through with some ringing guitar work, there were some breathtaking moments as well, especially during the extended In Held 'Twas in I. And, even after two encores, the band and orchestra won one of the longest rounds of applause I've heard in some time. CASSIDY, Oh dear, what's David saying about the Partridge Family? NME's Musicians' Poll concludes with the bass players and drummers. And he gets some points as well, because all-girl band Fanny obviously likes Procol Harum. To me, it's one of life's minor mysteries that Procol Harum isn't a lot bigger at home in England. At present, they are touring Scandinavia, and Thursday night they played two concerts at Copenhagen Falconercenter to more than 3,000 enthusiastic fans. And they are just unique. They are completely on their own; it's one of the most personality packed bands ever from the beginning to the end. They play the music we know and love, classical inspired as always, featuring keyboard men Gary Brooker on piano and Chris Copping on organ. And, though the music is so very well known and practically without any surprises at all - because they so easily transform their record-sound to stage - it's a thrilling experience every time, because the music is so unique. Gary 'The Voice' Brooker introduced a few selections from their forthcoming LP, called Grand Hotel, some in the well-known style. But the title track was a bit different, humorous and old fashioned - almost waltzing in parts. But the very highlight of the performance was the last ten minutes or so: a tremendous live version of the Autumn bit of In Held 'Twas In I. One of the most beautiful pieces of music ever written, and, played live just as exciting as on the record. NME, November 4, 1972 includes a huge pull-out poster covering 20 Years of Chart History. Here Derek Johnson presents The points table chart of charts 1952-72, The Top 500 artists, ranked by points awarded on the weekly Top 30 (30 points for a No. 1, down to 1 point for a No. 30). Chris Copping, BJ Wilson and Mick Grabham of Procol Harum were sitting around the lounge of the Buffalo Holiday Inn. This writer, who had driven over to hear Procol in concert with Steeleye Span and Tir Na Nog, noticed that Wilson was a bit under the weather (his complexion resembled that of a beached whale). Maybe it was Wilson's illness, maybe it was just being in Buffalo (neither the worst nor the best of the American-Canadian border towns), or perhaps having to play two concerts in one evening, but Procol were not inspired. It was virtually the same set the band delivered five months ago in Toronto's O'Keefe Centre, but there was all the difference in the world in the performance. Not that it was anything one could put a finger on - these things never are. Just a general feeling that something wasn't right. On the other hand, the audience response was not the type to prod a band into bigger and better things, though. All three bands were received politely (the audience was obviously enjoying itself) but none was called back for an encore. Procol played two encores as much out of habit as from demand, while Tir Na Nog and Steeleye Span simply left the stage without any attempt at encores. The remarkable thing about all this was that Steeleye Span had the audience in the palm of their collective hand for the entire set. The real value of the concerts, then, besides the opportunity to size up Steeleye and Tir Na Nog, was the introduction to Mick Grabham, Procol's newest guitarist - their fourth, replacing Dave Ball. Grabham struck me as being quite a competent guitarist though, of course, it is hard to tell how good a guitarist when he uses someone else's style (he's locked into the Procol sound that has been handed down from guitarist to guitarist) even though it's not his fault. He stood out nicely on the newer material, where he had a chance to display some new ideas. But too often during the night he was hampered by equipment problems. (If it matters, Grabham is a charming person, one of the nicer musicians I have met). The other group members are definitely impressed by Grabham, so much so that they have decided to re-record all the completed tracks on their Grand Hotel album using Grabham instead of Ball. PROCOL HARUM. Live At Edmonton (Chrysalis). 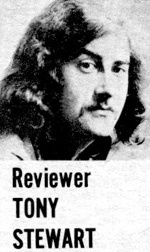 Tony Stewart more or less single-handedly put Procol Harum back in the NME on a regular basis, although his knowledge of the band left something to be desired (check the review of the A Whiter Shade Of Pale / A Salty Dog re-issue).